People should take a lesson from the last days of former prime minister, Narasimha Rao. Nobody could have imagined that a man who has been a freedom fighter, intellectual, linguist, economist, chief minister of a state, central defence and external affairs minister and ultimately prime minister of a great country, one who was credited with initiating economic liberalisation and privatisation in the country, was lost to ignominy and oblivion. Congress leaders after his death in Delhi did not allow the last rites to be held there or a samadhi built for him in Delhi like other national leaders. After setting the pyre on fire, congress leaders, his near relatives and even his own sons did not consider it expedient to stay there for more time. People were astonished to see his naked and half-burnt body, and dogs hovering around it in the cremation ground. Nobody could believe that a man who was called ‘Telugu Buda’ and ‘Chanakya’ would meet such a humiliating end. Some people may not believe it but the truth is that nature had turned him into an object from which people could learn a lesson. 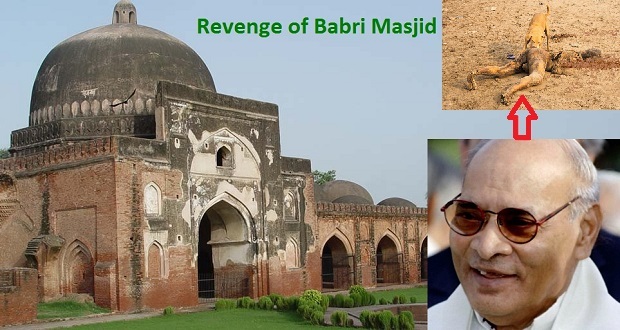 A learned man with so many qualities was lost in ignominy because of the demolition of Babri Masjid. When the Babri Masjid was being demolished, Narasimha Rao with all powers at his disposal, remained a silent spectator. He sat at ‘puja’ when the ‘kar sevaks’ (volunteers) began pulling down the mosque and rose only when the last stone had been removed. But nature made him a spectacle for the whole world to see the humiliating end of the latter-day Chanakya. The write up is thought provoking and really a lesson ! Your reply answers for so many destructions globally for 1000 of years. Looters trying to be choosers???? Writer is idiot! That body is not of Mr .Roa. And what about the when Muslims damaged many Hindu temples.? What is suppose to happen them? If possible pls try to bury him properly. ab kuchh bacha to hoga jo bury kroge. jay prakash bhaijaan not only pv Narsimha rao or hindus agar musalman log b Allah k ghar ko nuksaan karenge ya tabaiee karne k liye koshish karenge unki saza b waise he hogi jaise gair khaum k logon ko diye jayegi.. Parwardigar har ek ka hisaab barabar karega duniya me b aur akhirat me b. Koi uss Rabbul alameen se bach nhi sakta chahe woh musalman hindu aur esaie Q na ho.. Allah iss saare Kainaat ka maalik hain.. Dua me yaad rakho allah hafizz..